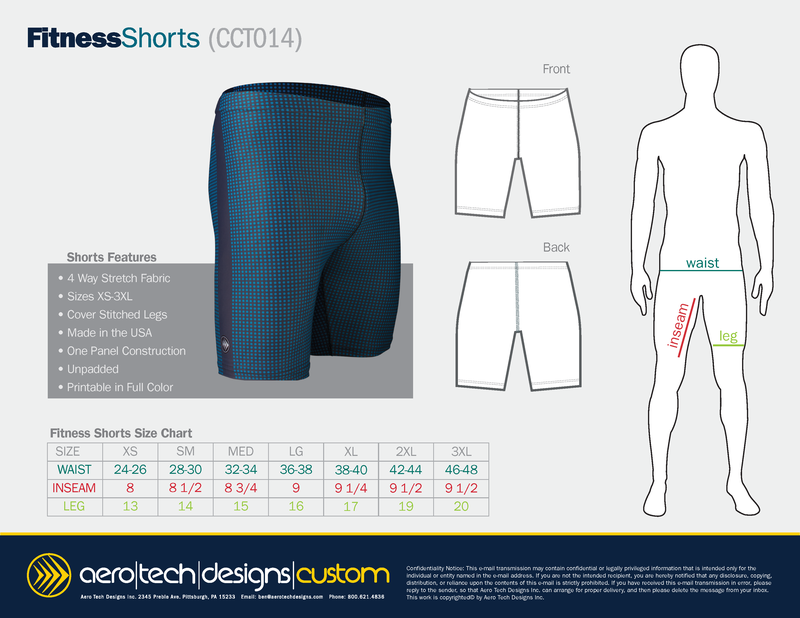 Aero Tech Designs is very proud to introduce the full coverage Fitness Compression Shorts. These shorts are so comfortable that it feel like another layer of skin that provides compression to reduce lactic acid buildup when you workout and fits snug against the body. We have taken what we learned from our professional cycling athletes and made this garment for multiple sports. Men's Compression Shorts are available with and without a cycling chamois pad. The men's compression fitness shorts make a great recovery short and active compression running short. Run, swim, workout shorts are great for a number of sports and cross fitness training! * Hem on legs won't ride up during vigorous exercise. * Legs are cover-stitched to be smooth and stretchy. * Spandex blend fabric has massaging 4 way stretch. The men's compression fitness shorts stretch spandex fabric holds your muscles in place, reducing vibration and thus reducing fatigue by increasing fresh blood flow to feed your muscles during your fitness activity. The men's compression shorts creates a stretching, massaging motion that squeezes out the blood to increase flow in and out of the working muscles. This increased blood flow from the spandex massage, reduces the buildup of lactic acid when you stop or take a long break. We recommend you keep your compression shorts on for an hour or so after your workout to help massage your muscles with greater blood flow that heals muscles after workouts. Keeping your muscles compressed reduces the pain associated with lactic acid buildup. Want a custom pair of Shorts? We can Help! Crafted with pride in the USA. Endless possibilities of color, text, logos, and design elements on your vest.